Why did Hillary Clinton compare Putin to Hitler? In the midst of the Ukrainian crisis, Hillary Clinton made a surprising — if not historically accurate — statement comparing Russian President Vladimir Putin’s actions in Crimea to those of Adolf Hilter’s in the early 193’s. Digital First Media’s member paper, the Long Beach Press-Telegram, broke the news, and they asked me to provide analysis on why she would say such a dramatic statement. With just hours before deadline, I spoke with famous Russian dissidents, international politics experts and political scientists to write this analysis, for dozens of our member papers across the nation. With just a few sentences Tuesday, Hillary Clinton showed she’s willing to play hardball if she runs for president. Speaking at a fundraiser in Long Beach, Calif., the former Secretary of State compared Russian president Vladimir Putin’s recent aggression in nearby Ukraine to Hitler’s actions before the start of World War II. The bold remark came after a year in which she’s mostly stayed mum on current events, even as she’s given dozens of speeches to private groups and conferences, and it drew attention. The words were something of a return to form for Clinton, who was more hawkish on foreign policy as a senator than she was heading the State Department for President Obama. Clinton’s aggressive stance on international issues in part led to her defeat in the presidential primary in 2008, when many Democrats were upset by her past support for the Iraq War. 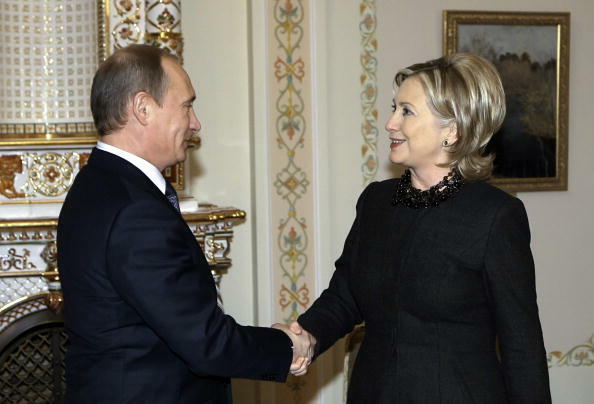 If she runs as expected in 2016, Clinton faces no serious primary challenge, so that is not really a concern this time around, but Republicans could seek to portray her approach toward Putin as Secretary of State as weak in the general election. Before speaking Tuesday, Americans’ most likely association of Clinton’s relationship with Russia would have been the time she and Putin pressed a red button in 2009 to “reset” the two countries’ relations. That could be one reason she came out so strongly against Putin’s actions, said Steven R. David, a professor of international relations at Johns Hopkins University. “Maybe she’s trying to send a signal that she’s tough and won’t tolerate this,” he said. In truth, David said the comparison with Hitler was actually pretty fair. Putin has moved troops into the Crimean peninsula of Ukraine, ostensibly to protect the area’s predominantly ethnic Russian population as a new anti-Russian government took power. At a fundraiser for a Boys and Girls Club in Long Beach, Calif., Clinton noted that was similar to military actions Hitler undertook in the 1930s. “All the Germans that were … the ethnic Germans, the Germans by ancestry who were in places like Czechoslovakia and Romania and other places, Hitler kept saying they’re not being treated right. I must go and protect my people and that’s what’s gotten everybody so nervous,” she said, according to the Long Beach Press Telegram. What’s more, the rhetoric Putin is blasting on state-owned TV about protecting Russians in Ukraine is almost identical to the propaganda Hitler paraded in the mid-1930s, said Vladimir Kara-Murza, a leader of a democratic opposition party in Russia. “These comparisons seem much less far fetched than they would have been a few weeks ago,” he said. Still, there’s a difference between saying someone is like Hitler and advocating for a military response, noted Harry Blaney, a senior fellow at the Center for International Policy, a Washington, D.C.-based think tank. In fact, Clinton backed Secretary of State John Kerry’s diplomatic approach in those same remarks in Long Beach. Blaney said that Clinton probably would not have made such an inflammatory comparison if she were actually in office, whether as president or Secretary of State. But as an outsider, she can use that kind of strong language to draw attention to the crisis and present herself as someone who’s willing to be tough on Putin. “She would not have said it if, one, she didn’t think it was appropriate for her future political career, and, two, she didn’t believe it was important to say,” he said.